| Knicker Locker shortlisted for an Award! If you're an avid romantic comedy film watcher, you will of watched all of these, just like us! Being "underneath" the scenes on the wedding day, we're not always the first ones hear about the ups and downs of planning and organising a wedding, that's why we got in touch with Lucy Edwards, an independent Wedding Planner from Dorset to find out some more details! Can you introduce yourself and where you currently work? I am the founder of Love Lucy Weddings, a Dorset based Wedding Planning Service for all weddings with any budget. I love all things weddings! I started working as a wedding planer in 2013 and fell in love with making people's big days exactly what they want. Tobe able to make a couple happy and give them the day they have always dreamed of is a very special thing. What is the best thing about being a Wedding Planner? I love the interaction with not only the bride and groom, but also with their family and friends. Even if you are only in contact with people for a few days, you create friendships and a bond which you would not make with other professions. To be able to help a nervous Best Man or an emotional Father of the Bride really makes my job the best. Favourite season for a Wedding and why? Summer weddings are always good, but I do love a spring wedding when the trees are full of blossom and the flowers are starting to grow. It is a time of new beginnings and so are weddings. What's your favourite part of a Wedding and why? The wedding ceremony is always a special moment. The bride walking down the aisle, the groom's face when he sees her. It is a moment of love and joy. I also love how each ceremony is slightly different for each couple, they are never the same. What's the one question you always get asked by couples? The one question I always get asked by couples is what should they do first. I always tell them once they have their venue and catering sorted, they can relax a little bit and then shop around for other suppliers such as photographers etc. It is helpful to have a check list to aid your wedding planning. What's the best advice you would give a Bride to Be? Don't get stresses out and don't take on more than you can handle. If you have a full on job, family or busy lifestyle, have a wedding planner who can take on a lot of the strain for you. Don't be afraid to ask for help with the wedding planning. Most importantly, on the the big day enjoy yourself and be with the people you love. No one knows what's supposed to happen and when, let the professionals do the hard work and you enjoy your special day. What's the strangest request you've had for a Wedding? I had a couple ask if they could have fish bowls on their tables with actual living fish in them for their table centres. Do you think that lingerie plays an important part of a Bride's day? Yes, especially when it comes to the dress. If the lingerie is not well fitted or does not compliment the dress, it can make a huge difference. have seen many brides who have not gotten the right lingerie for their dress and it can really show. Also the bride is uncomfortable for the entire day. Have you given any Bride to Be's advice on bridal lingerie? Make sure it is well fitting and compliments the dress. You are going to be in it for a long time and you need to be comfortable. Lastly, what's your favourite wedding movie of all time? Father of the Bride - hands down the best wedding movie ever! Backless, strapless and super adhesive with a special lace centre front to enhance lift and cleavage. Works perfectly with sweetheart necklines, halter-necks and strapless wedding dresses. 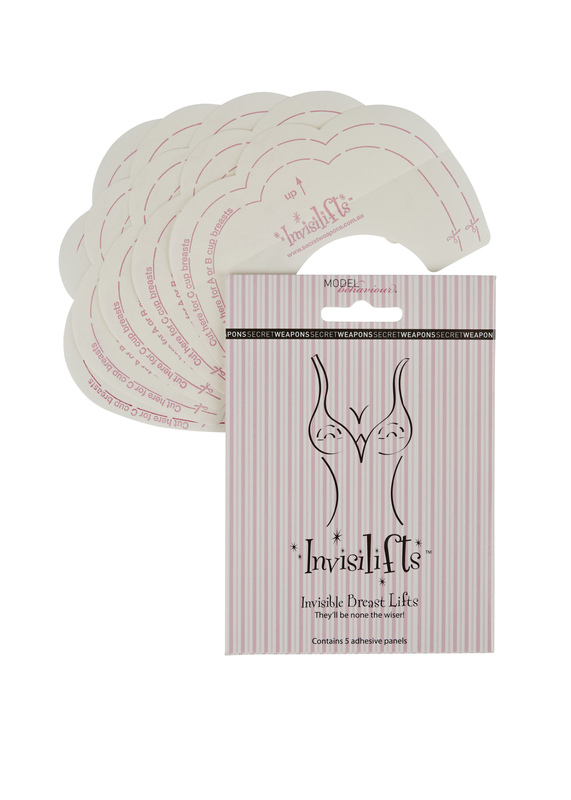 Invisible self-adhesive miracle workers that are applied to the top of your breasts to give them lift and shape underwear your wedding dress. You can trim them if they are visible and are available in two sizes, A-D and DD-F.
Offers a backless solution under your wedding dress. They stick to the breasts with adhesive and clip together at the centre to provide lift. Comes with a handy travel case! Backless, strapless silicone bra that offers lift and increases your breast size by one cup size. Super comfy and reusable for other occasions apart from your wedding day! Gives the perfect silhouette under your wedding dress. This faithful strapless bra has integrated padding and smooth cups for great lift and shape. Comes with adjustable straps to wear as a cross-back, halter-neck or one-shoulder. Weddings are far from traditional these days, so if you want a giant adult bouncy castle...you can have it, or even experience animal encounters...you can have it. So who's to say you can't stray from the traditional with your bridal lingerie. Love our Wedding recently featured the beautiful Embrace Lace set in their bridal lingerie edit as the ultimate 'something blue' for the wedding day.